It is with grave embarrassment that I start the new year with a blogging cliche: sorry I haven’t posted in a while but I’ve been rather busy. Not that this isn’t true, of course. The latter half of 2018 was a whirlwind of projects that started in July with the delivery of Flow State, a major commission for the Francis Crick Institute in London that has 28 video monitors playing synchronised video art using Raspberry Pi’s and Fugio’s network time engine. Flow State took 18 months to make. After the launch in July, I had one day off and then things got really busy. I spent August doing a EMAP residency at LABoral in Spain with Anna Dumitriu creating an underwater robot called ArchaeaBot. It contains a Raspberry Pi Zero and a PiBorg motor shield, and has an evolving machine learning system running on it to control the motors. As soon as we had a working prototype, we took it to Linz in Austria to be part of the main exhibition at Ars Electonica, the biggest media arts festival in the world that was celebrating it’s 40th anniversary. A week later we were back in Spain, exhibiting it at LABoral. Trips to Hull, Athens, Philadelphia, and Amsterdam followed, then driving to Bourges in France to exhibit at Bandits-Marge, then driving up to Utrecht in The Netherlands to exhibit at IMPAKT in their “A World Without Us” exhibition, which is on until 3rd February. Finally, just to top the year off, I went to Guangzhou in China for a week just before Christmas. This has all been a rather excellent opportunity to work on my Algorithmic Photography project that uses Fugio to process 5 minute videos into stunning digital timelapses. You can find the latest images on my Instagram, and buy prints at algorithmicphotography.com. But this isn’t to say that there hasn’t been software developments going on in between. Fugio has received some periodic updates including a new Italian translation by MassiminoilTrace, which are available in the weekly builds on the download page. It’s been useful to take a step back and look at how it has evolved. There are areas where it’s very strong – it’s great at quickly piecing together new ideas, and other areas where some work needs to be done. It’s tempting to create nodes for everything, but some areas of programming are far better suited to being scripted, which has led to an unsteady balance of functionality between nodes and Lua scripting support. For instance, if you wanted to draw a range of different dynamic items that are changing over time, scripting is going to be far more suitable than the more rigid structure of nodes. Where nodes come into their own is for rapidly putting structure into place and enforcing separation of components, which is generally a good thing for reuse and understanding. With this in mind, I’ll be shifting things around, retiring some nodes and adding more Lua libraries. I’m also in the process of adding some new features that should make editing, sharing, and organising patches a lot faster and easier. I also want to bring back the timeline feature that disappeared a while back as I wasn’t happy enough with the interface. Painting With Light is getting an upgrade to v2.0 with a rewritten rendering engine and support for Linux – even Raspberry Pi. Freeframe support is currently on hold as there are changes coming that will be incompatible with the existing standard. Please note that if you choose to purchase the 64-bit FFGL plugins, they won’t work with future Resolume 6 updates. While we’re still wrapping the final presents at bigfug HQ, I wanted to wish you all a very Merry Christmas and thank you for your kind support over the 12 months. It’s been a full and exciting year (albeit with a few weird bumps along the road (am still sad about Bowie!)) and I’m looking forward to working on some great projects and releasing some very exciting features for Fugio and Painting With Light in 2017. Do keep your comments, suggestions, and bug reports coming in. They’re invaluable to helping me make the software even better. Author bigfugPosted on December 24, 2016 Categories Software NewsTags fugio, fugio friday, painting with lightLeave a comment on Merry Christmas! For the new art installation I just completed at Birmingham Open Media (BOM) for the upcoming Ingenious and Fearless Companions exhibition, I had to create some new brushes to use in Painting With Light. You can click on each brush below to get each full size brush individually, or click here to download a zip archive of all four brushes. I’ve made a new release of Painting With Light for OSX and Windows that fixes a couple of critical bugs in the Sequencer, and adds this rather lovely installer for OSX! In a recent workshop we experienced some issues with versions of OSX. After some research into the subject, I may have to recommend a minimum of 10.9 (Mavericks). PWL definitely won’t run on 10.6 (Snow Leopard), but you might get away with 10.7 (Lion) or 10.8 (Mountain Lion). 2016 will shortly start rolling around the globe, so I wanted to quickly get in a last minute summation of what’s happened in 2015 and an update on what’s to look forward to on this site in the new year. Firstly, I want to thank all of you for reading and subscribing to this site, and for using and buying my software over the years. I very much appreciate the support and feedback, which encourages me to find new ways to create useful tools and features that open up new creative possibilities. Painting With Light has had quite a few new features added to it over the year, including audio playback support, a built-in video sequencer, new layer blending modes, more advanced mapping controls, and layer masking. Over the year, I used Painting With Light to create art installations, including a live video mapping performance at the inauguration of Serre Numérique in Valenciennes, France, and running workshops. Fugio was announced, which is a project I’ve been working on for a couple of years that provides a high-level visual programming interface to low-level coding, including Oculus Rift support, DMX, OSC, and a powerful timeline system. I initiated a Fugio beta testing program to get some feedback on the software before I attempt a public release. Early 2016 is already shaping up to be rather busy, including workshops and talks on the west and east coasts of America, as well as many UK activities being finalised. I’ve recently added (but not yet released) HAP video support to both Painting With Light and Fugio, allowing for playback of more HD video streams simultaneously, with synchronised audio. There is also native support for high DPI screens in both applications, such as Retina displays on OS X. There are also plans for a new mesh tool in Painting With Light to address situations that aren’t currently addressed with the existing tools. I’ve got Fugio compiled and running on Raspberry Pi (although the OpenGL rendering is still giving me a few headaches), with the aim to be able to create live digital artworks that can be physically installed without leaving valuable computers around. So, with so much talk about Fugio, the question that is most asked is regarding when it will be released. To answer this clearly, we need a bit of context. I started Fugio as a timeline project to control PWL, and synchronise lighting and audio for a theatre performance back in 2014. As the project developed I started to see great new creative opportunities with being able to finely control the timing of media playback coupled with live interaction. Close to its initial release, I tore the whole thing apart and rebuilt it as a node based visual programming system so that I could reconfigure the components as needed. This system now forms the core of my art projects. Once I had amassed a certain level of functionality, I decided it was time to get some more eyes on the project and ran an open call for beta testers. The feedback came in slowly and was pretty crushing. As well as the expected level of early bugs, no one could see how to use it, it wasn’t clear to anyone what it was for, or what everything did. In hindsight this was all very valuable, though I’ll admit after working on the project for over a year at that point, I felt like I’d just ploughed a lot of time and effort into a stupid failure. It’s taken me a few months to recover and regroup from that experience. I had a good amount of travelling to do in that time, and fortunately had the opportunity to sit on the hot sands of Laguna beach in California, stare out to the Pacific, and do some soul searching. Where I got to, and the reason I can relate all this publicly, is that my priority and passion is making art. Sometimes, when I get all caught up in the excitement of coding, I seem to forget this and seemingly form aspirations of running a company selling software. As I mentioned earlier, I’m very thankful for the money that comes in via sales of Painting With Light and my plugins. It really helps justify spending more time adding features and fixing bugs. But turning it into a larger commercial organisation just isn’t where my heart lies. With this new found clarity, I began to re-evaluate my original aims for Fugio and what I want from it. While a full discussion of this subject would at least double the size of this already weighty post, the core decision came down to one of ‘when’, not ‘if’ to open source the project. I talked to a whole bunch of people about this including a kindly Mitch Altman who talked with me about it and ended with saying “go for it”. I choose to do this because I want to make the best art that I can make – the software is, and will always be, secondary to that. So, this is how I greet 2016: with blood pumping from adrenaline, riding fast into the night with the headlights only illuminating the road a short way in front of me. I have one main feature to add, which is the ability to group nodes into components that will make organising, reusing, and handling large patches infinitely better, I’m aiming for a February/March release on GitHub. If you have any suggestions, comments, or bug reports, either send them directly to me via the Contact Page or post them on the Facebook Page. Painting With Light 1.5.1110 BETA – AUDIO!!! NEW: Reworked layer blending with 24 new modes! 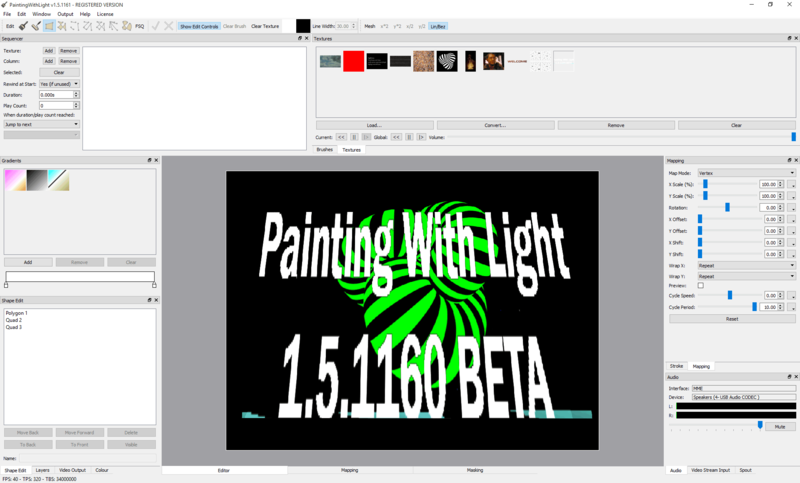 Author bigfugPosted on August 29, 2015 Categories Software NewsTags beta, painting with lightLeave a comment on Painting With Light 1.5.1110 BETA – AUDIO!!! 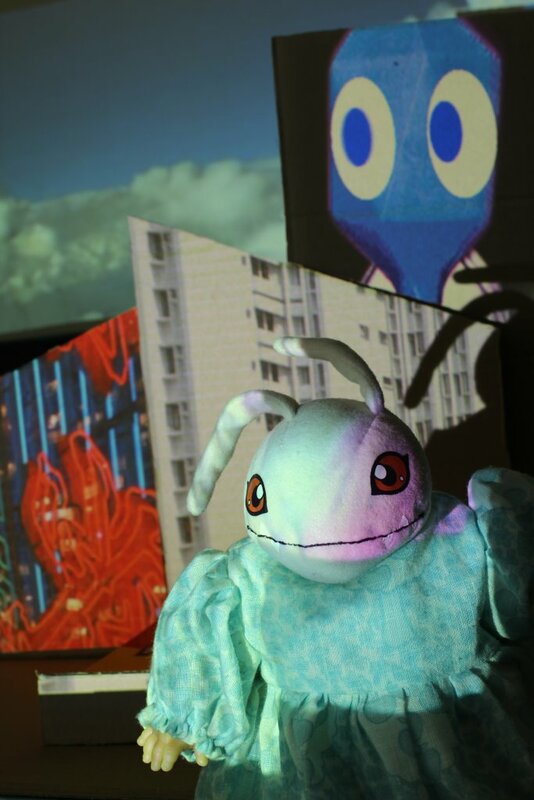 Alex May and Exploring Senses will work with young people to design and construct a stunning cardboard cityscape bringing it to life with video mapped projections using May’s accessible software Painting with Light, and populating it with ‘toy hack citizens’. The young people’s workshop is free and open to a limited number of participants aged between 13 and 19. It runs 7:00-9:00pm on Friday 18th September 2015 and 1:00-5:00pm on Saturday 19th September 2015 and participants may attend either or both sessions. Please book via eventbrite to join the workshop sessions and provide a contact phone number and name for the parent guardian. 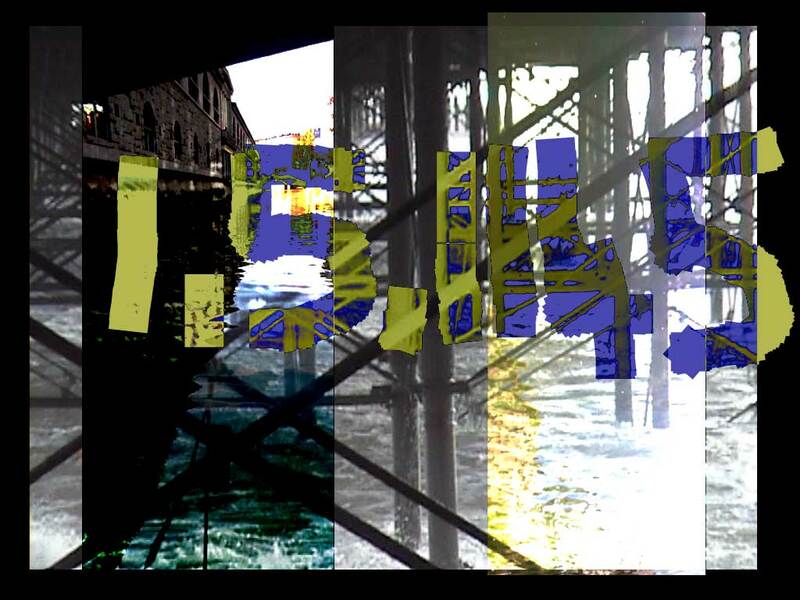 The event is supported by a Brighton Digital Festival Education Award and is part of Phoenix Brighton’s flagship Artistic Learning Programme. The final installation will be open to the public from 6-9pm on Saturday 19th September 2015. All welcome, no need to book.